Because of the convenience of having a key readily available at the property, rental property and vacation property owners frequently install a key lock box to control access to their keys. This approach is not only a saves money, it is much more convenient for both the renter and the property owner or manager. Lock boxes for keys have become one of the favorite methods of storing property keys in many vacation areas. These key boxes allow property owners and renters to be independent of each other's schedule. Our custom lock boxes take the convenience one step further by adding a built in key retractor and an optional tamper proof key-ring. In addition to the benefits a regular key box provides, our key lock box with the built-in key retractor adds several security measures. The key retractor, being 4 feet long, means that the key never has to be detached from the lock box. The retractor is attached to the lock box with a tamper resistant screw from Keedex. The optional tamper proof cable key ring, from Luckyline, means that the property owner knows for sure that their key has not be duplicated without their knowledge. 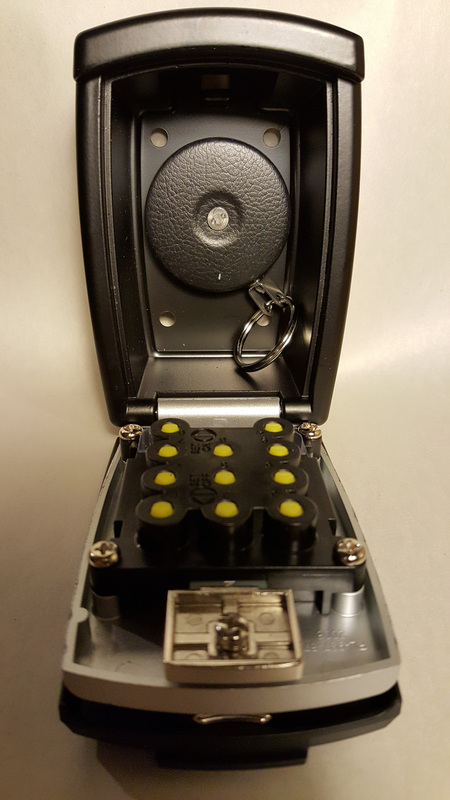 With our custom key lock box, our customers don't have to worry about their house keys (or any other keys for that matter) 'walking' off or being surreptitiously duplicated. On Order - Arriving soon!! Copyright Selectlocks. All Rights Reserved. We ship to all military APO's, Canada and other international destinations. Selectlocks.com is a woman owned small business located in Arvada, Colorado.